NEW! 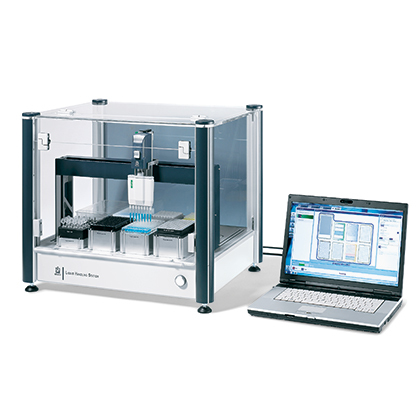 The BRAND Liquid Handling Station (LHS) pipetting robot reduces repetitive manual pipetting and increases laboratory efficiency and reproducibility through automation. The LHS is an extremely compact benchtop instrument that has 7 working positions and 5 available liquid ends in single channel volumes up to 1000µL and multichannel volumes up to 300µL. With a wide variety of accessories, this flexible system moves liquids between reservoirs, tubes and plates; and is ideal for plate reformatting, ELISA and PCR setup, cherry picking, etc. The Liquid Handling Station is supplied with extremely user-friendly software—liquid handling protocols are created with ease!